Welcome to NASBLA Connect, the NASBLA online community. We are so glad to have you. Let's get started. 1. Sign in, if you haven't already done so by using the upper right hand navigation button. Having problems signing in? Contact info@nasbla.org for help. 2. Tell us about yourself. 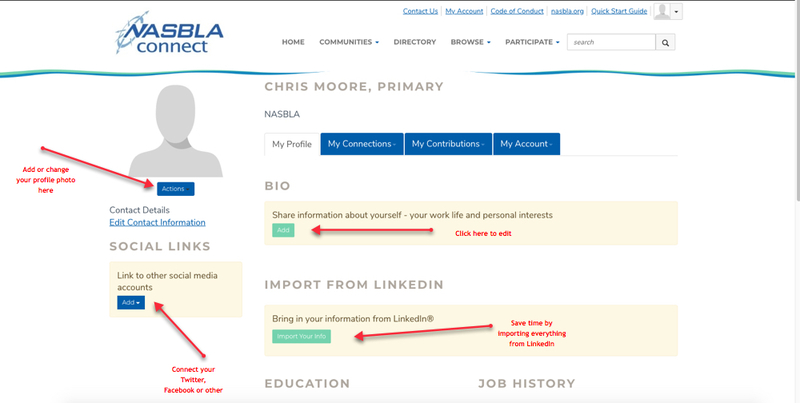 Fill out your profile either manually or by importing your information via LinkedIn. The more content you share about yourself, the easier it will be for like-minded peers to connect with you. 3. Customize your profile settings. While on your profile page, click on the tab for My Account. Here you can set up how you want to receive emails from the community, how much of your profile you want visible to other members, design the signature area that appears under your discussion posts and more. If you have any questions about what a certain setting means, please email the Community Manager at ron@nasbla.org for help. Email Delivery Options: Your frequency can be in the form of a daily digest–a single email each day summarizing the hottest topics in your community, or stay informed in real time with instant alerts. 4. Build your contact list. Select Directory from the top navigation bar. 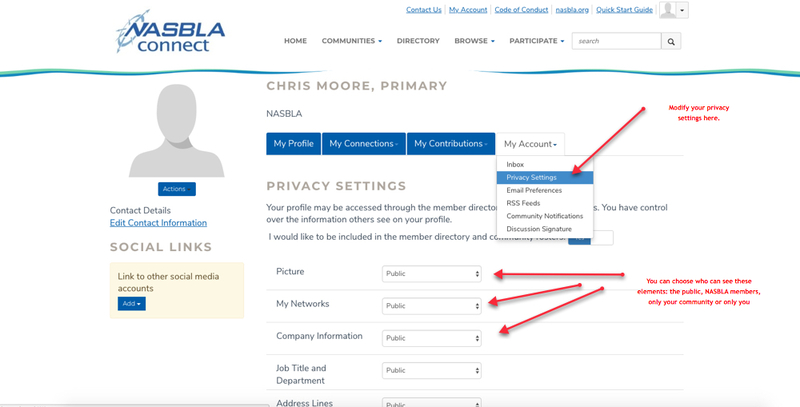 Click Member Directory to find friends and colleagues belonging to NASBLA. Creating a contact list helps identify relationships and build searchable networks. Our Advanced Search option offers further parameters for making connections. 5. What now? Join the conversation! Ask questions. What do you want to know more about? Have a question about anything from professional development to everyday problems? There's someone out there with the answer. Share ideas. Is there a hot topic you want to discuss? How about a lesson you've learned that might help your fellow members? Start a discussion thread to give others a peek inside your world or to demonstrate your expertise on a topic. Spread knowledge. ​​Check out our useful resources, such as the NASBLA Public Library, to see what others have uploaded and keep the sharing going. 6. Problems? Please email the Community Manager with details of what seems to be the problem. The more detail (screenshots, etc.) the better! Be sure to note which browser and operating system you’re using.